SCOTTSDALE, AZ--(Marketwire - Feb 20, 2013) - Deciding where to say "I do" is one of the most important decisions a bride and groom can make, and the Courtyard Scottsdale Salt River offers elegant event space at its lodging in Scottsdale, Arizona that's the perfect backdrop for the big day. Offering more than 6,000 square feet of indoor and outdoor event space, this hotel's Scottsdale wedding venues range from the large Eagle Mark Ballroom to the intimate event patio; with more event space than any other Phoenix Courtyard property, guests are sure to find the venue that's right for them. 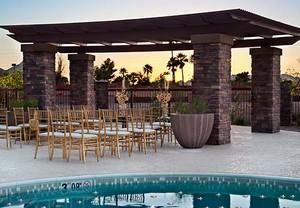 In addition to its wedding venues in Scottsdale, AZ, the Courtyard Scottsdale Salt River is also a wonderful option for receptions, brunches, family reunions, graduation parties, banquets, corporate functions and other celebrations. Choose from custom event menus, including seated dinners, energizing breakfasts, themed lunches and elegant cocktail receptions. This North Scottsdale hotel also offers preferred pricing on group bookings of its Scottsdale accommodations, making it easy and affordable for out-of-town guests to stay at the event venue. Plus, visitors can explore the area in their free time, whether golfing at any of the more than 200 nearby courses, checking out spring training or an outdoor festival at Salt River Fields or shopping boutique labels and top designers in Old Town Scottsdale. The lobby is the perfect place for wedding guests to gather during their stay. Offering inviting seating areas, free Wi-Fi and Starbucks® coffee, beer, wine and good food at The Bistro, the modern great room is the perfect way to bring together friends and family. An award-winning North Scottsdale hotel, the Courtyard Scottsdale Salt River is both comfortable and convenient. With a LEED-certified design and environmentally friendly practices, this hotel features a modern, smart design from its more than 6,000 square feet of indoor/outdoor event space to its spacious guest rooms. Its flexible lobby space is where guests gather to meet and mingle with colleagues, family, friends and other visitors. Connect with free Wi-Fi, gather around one of the inviting seating areas, catch up on news and weather via GoBoard technology or grab a drink and a good meal at The Bistro, serving Starbucks® coffee, beer and wine, plus delicious options for breakfast and dinner. Guest rooms feature plenty of space for work and relaxation and include plush beds with thick mattresses, crisp linens and fluffy pillows, high-speed Internet access, a flat-screen TV, microwave, refrigerator and dedicated work space with a desk, ergonomic chair, plenty of lighting and numerous outlets. A number of rooms offer additional sleeping space with a sofa and two queen beds. To stay on track with health goals away from home, head to the fully equipped fitness center or outdoor pool. This hotel's Scottsdale/101 corridor location is convenient to the area's best attractions including shopping, dining and nightlife in Old Town Scottsdale, more than 200 golf courses and spring training and outdoor festivals at Salt River Fields. Deciding where to say 'I do' is one of the most important decisions a bride and groom can make, and the Courtyard Scottsdale Salt River offers elegant event space at its lodging in Scottsdale, Arizona that's the perfect backdrop for the big day.